May-Thurner Syndrome (MTS), also known as Iliac Vein Compression Syndrome, is an asymmetrical swelling of the legs – the left leg swells but the right leg does not. In its milder forms, the leg may not even swell. One side may simply have more severe vein disease than the other. MTS is a common condition, but varies significantly in severity. It has been estimated that as much as 10 percent of the population is affected, and it is a common cause of spontaneous deep vein thrombosis. Our surgeons are very experienced in treating this as well as other disorders of the deep veins without an incision or downtime, getting you back to ideal circulation as soon as possible. 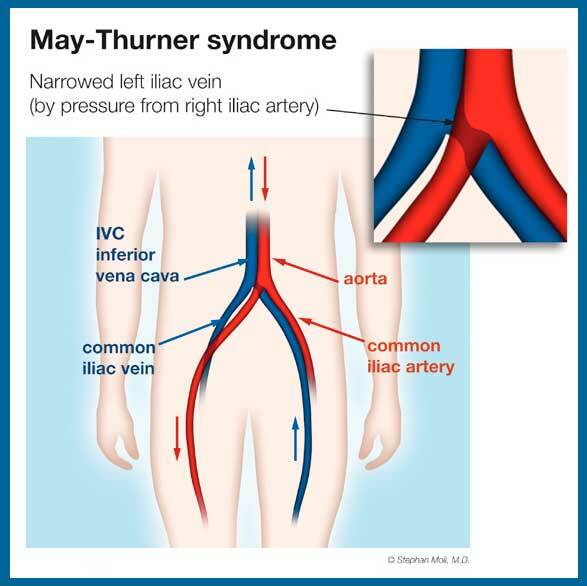 May-Thurner Syndrome occurs because the left (or uncommonly, right) iliac vein is compressed by an artery. (The iliac veins and arteries lie deep in the pelvis). This compression of the iliac vein impedes venous drainage of the left leg leading to \ swelling and disproportionate vein development. How do I know if I have MTS? Many people do not know they have May-Thurner Syndrome. If one of your legs are more swollen than the other, or has a worse vein problem, you may be affected. What is the treatment for MTS? 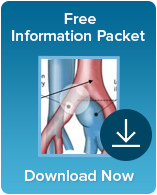 MTS is treated by relieving the vein compression with a stent or angioplasty.